Last Friday our administrator at work celebrated an even number and we will celebrate her tomorrow so I wanted to make a card. I deiced to use this beautiful stamp that i got home last week and I just love how it turned out! The colors are just so wonderful with the ribbon. 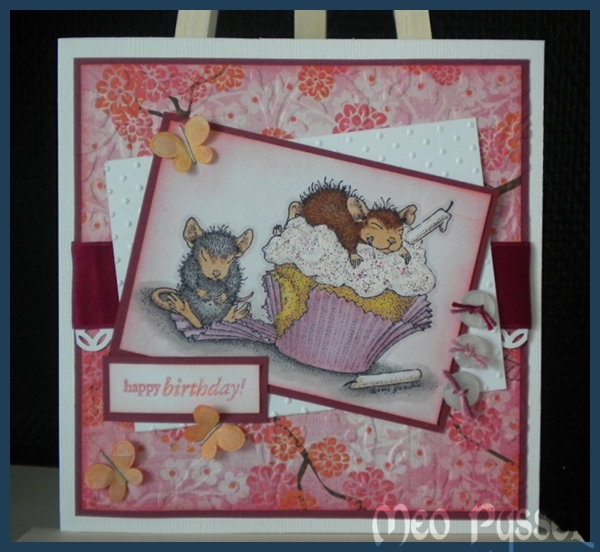 Stamp: House Mouse – Gruffies – Thanks a bunch – Lilac Bouquet. 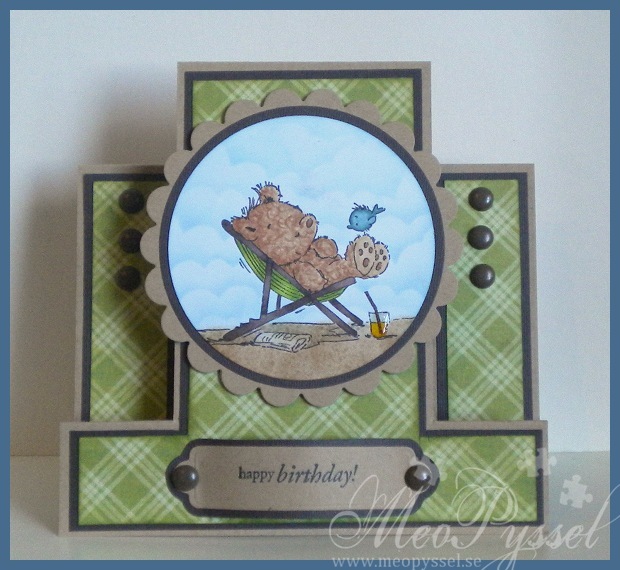 Penny Black -Critter Party – Happy birthday. Today is my dear stepfathers birthday and I did this card this weekend. There is an photo of Olle when he is resting in our hammock and always when I think of summer and Olle i think of that photo. The history behind it aren’t that pretty but the photo is etched to my memory and as soon as i saw this image from Lili of the Valley I just new that i needed to have it and that many cards from now on for Olle will be with this motive. Anyway the card is a step-card, you can see my blueprint for it if you click the link. The papers are from DCWV’s The Guy Stack. The image is always colored with Copics and I just my new E70’s pens for the wood and the chair and I really like that shade to this dark cardstock. 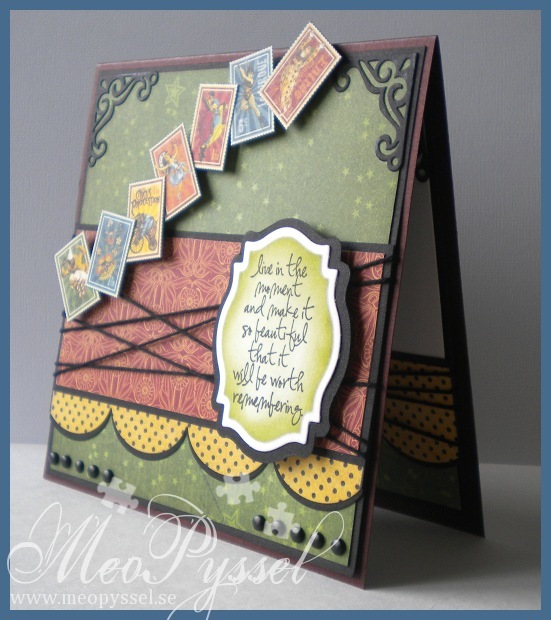 Dies: Spellbinders – Nestabilities – Circle, Scallop Circle. Spellbinders – Shapeabilities – Double ended tags. Other: Distress Ink – Peeled Paint, Broken China, Vintage Photo. Glossy Accent. So today I wanted to practice my CAS-cards and deiced to use a Penny Black image. 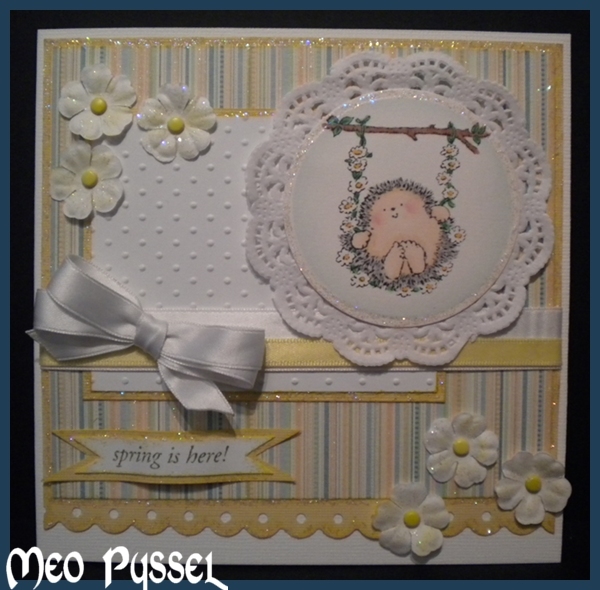 I haven’t used one in a while and I have a couple that is perfect for spring cards. I’m longing for a nice flowery spring instead of the rainy and gray one i have outside right now. 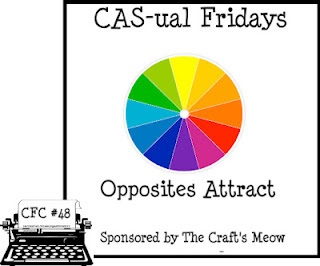 In the CAS-ual Fridays challenge for this week you are suppose ti choose opposite colors from the color-wheel and i Choose a green for my stems of the flowers and then matched it to the opposite, red, for the roses. The stamp is from Penny Black’s set Piece of my heart and the sentiment is from another Penny Black set called Garden Friends. To frame the image i Embossed Spellbinder’s Label 18 using a emboss only technique I first saw on Stamp Tv. To also be able to join this weeks Penny Black Challenge I added a striped ribbon and made some dots on the pot. On the pot i tried out some of my new copics (the E95-99) and i really do love them. They give a very nice terracotta tone. The only problem i find with the lightest ones (E93, E95) is a slight bit to pink for me, i would have wanted a color between E95 and E97. I need to apologize for the poor photo but my dear husband-to-be is making a big mess in the kitchen which is the place i usually photograph in due to the big window. So i just did my first Penny Black card for the order. 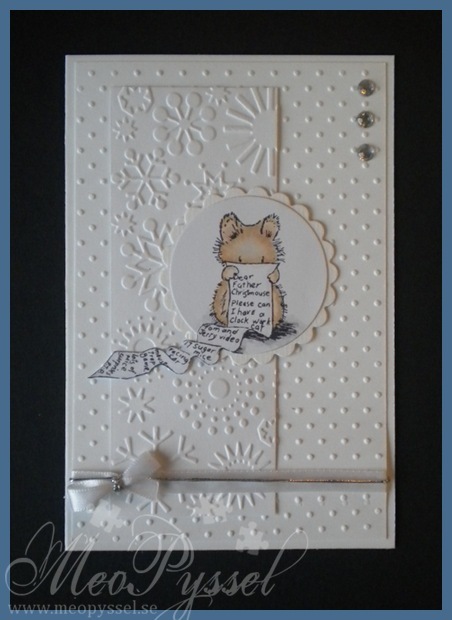 I have for a long time now wanted to try to make a all white card and when Penny Black’s Saturday Challenge had an challenge of a white and silver card i just jumped on the challenge. I did use two embossingfolders from provocraft, the Snowflakes one and the Swiss dots. The image is on of the ones (and one of my favorites) from Penny Black’s Christmas Critters set. 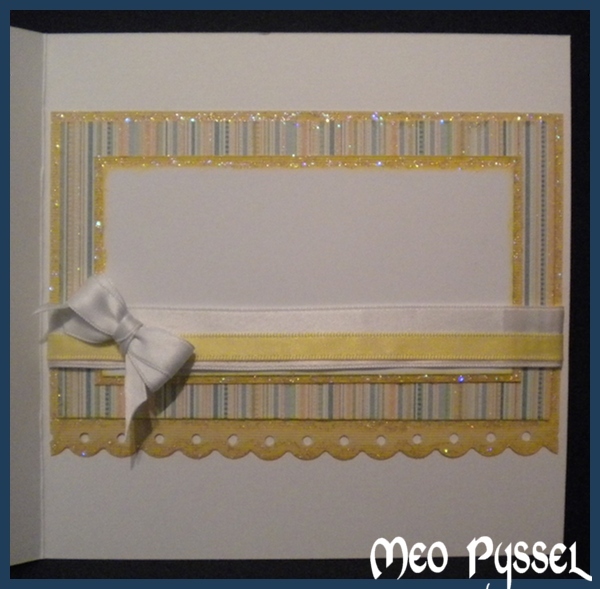 The card is decorated with a white ribbon and some silver thread. I also used some rhinestones that gets a bit of silvery shine against the white aof the card. 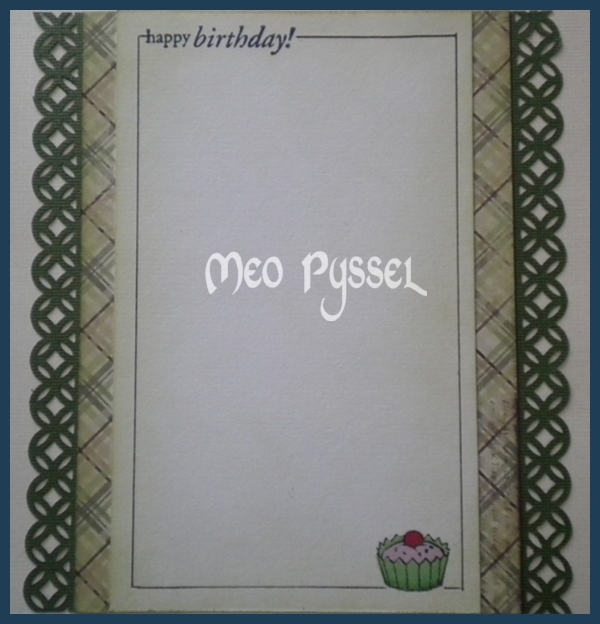 This card is for my dear brother. His birthday was for a few month ago but we haven’t seen each other so i haven’t hurried with the card until now (we will meet this weekend). So a bit late, maybe, bu Happy brithday Oskar! I did choose the colors by that fact that my dear brother told me he liked dark red and green and gray colors with a bit of old texture. I didn’t fin and burgundy or grays but i really like this green paper from Grapic45’s collection Le Cirque so i kept going from that one. All the papers i used if from the same collection. The stamps or circus-pictures that i used across the card is also from the same collection and i simple cut them out and put them up on foamdots. I did use this weeks MOJO Monday sketch for my layout. 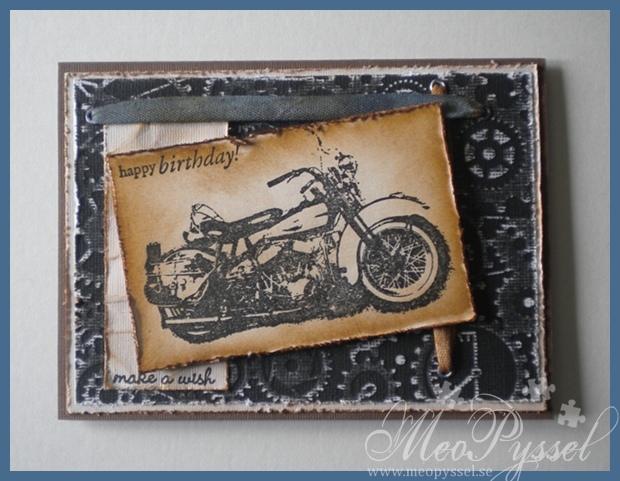 The focal-point is a Tim Holtz sentiment from the set Urban Chic. I actually started out with the sentiment, that i really is suitable for my brother when he really is out there living his life. I was after i had the sentiment i wanted the circus-stamps. I think it work very well together and i hope my brother will understand the connection and that I’m just amazed over his lifestyle. Anyway… i did frame the sentiment with my new favorite Nestabilitie, the label 18. I cut it out with one of the smaller dies and the traced around the outside of the die on a black paper to get a smaller frame to back it to then i would have got if I used the bigger die for the frame. That is one thing i dislike with the labels, that it’s a big difference between the dies but as long it can be traced around I’m not gonna be to noisy about it. The green paper and the sentiment have been distressed with Peeled Paint and all the other papers have been with distressed with Antique Linen. The scalloped border is made by my new (and i think it will be an favorite) MFT’s Jumbo scalloped border. I did cut it twice, once in the dotted paper and once in the black so i could the a nice definition against the other papers. The other embellishments are the already mentioned stamps and some regular black brads and some black twine. I did embellish the corners with one of the corner-dies in the vintage die-set. I so love the contrasts in the card, brought fourth by the black details. I tried to keep the same layout for the bottom of the inside with a feel smal changes, of course, to give space for the written greeting. 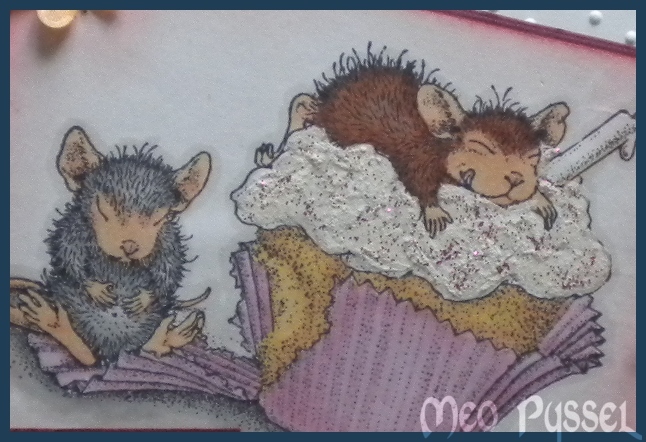 The stamp that is used is from Penny Black’s clearstamp-set Critter Party. Other: Peeled Paint and Antique Linen Distress Inks. This card is for my Cousin that turn 18 this Wednsday. The papers are cardstock and the black one is a Cor’dinations that i have dry-embossed with Provocraft’s embossingfolder Clockworks and then i sanded it to make the white core appear better. All edges have been thorn and distressed with Vintage Photo. The the light block with the sentiment has been wrinkled and distressed with Vintage Photo. The image is from Tina design found at the store Arkivet. I bought this one and a steam-engine train this Wednesday on Arkivet’s 7th birthday and i love them, it’s gonna be much easier to make masculine cards. The senitiments are from Penny Black set Critter Party. The ribbons is put through a couple of eyelets (white ones) that i have sanded a bit and lightly colored with black stazon. The ribbons have been colored with distress-inks. The brown one is only Vintage Photo and the other one is a mix of Black Soot and Weathered Wood. I first mixed some water and ink and make some spots on the cotton ribbon and then i used my blending tool to color in the rest, then they were the dried with my heatgun. The layout is by this weeks Sketch Saturday (the first picture to the right) and the Technique is from The Shabby Tearoom and is about dry embossing (the second picture to the right). This is the result from yesterdays craft-session with my sister and her friends. The layout is from this weeks Mojo Monday (#187). The image is one from Penny Black’s clearstamp set Piece of my heart, and as usually it’s colored with promarkers. 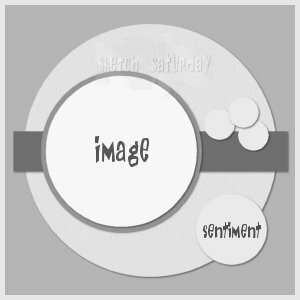 The word “smile” on the images tag is a part of a sentence from House Mouse’s set Birthday: Ice cream. And the text in the left bottom corner is from Penny Black Critter Party and the “just for you” on the tags, that is the Quickutz die tags, is from Hero Arts Warm wishes. The border is made with Martha Stewart’s borderpunch Modern Garland. The papers are from Maja designs collection “Ska vi ta en fika”. 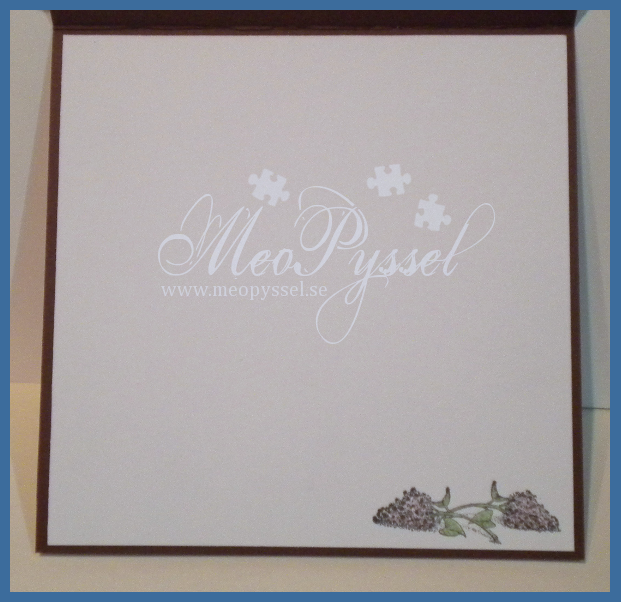 The white paper have been dry embossed with provocrafts swiss dots embossingfolder. The other decorations are just light green pearls and dark green brads. 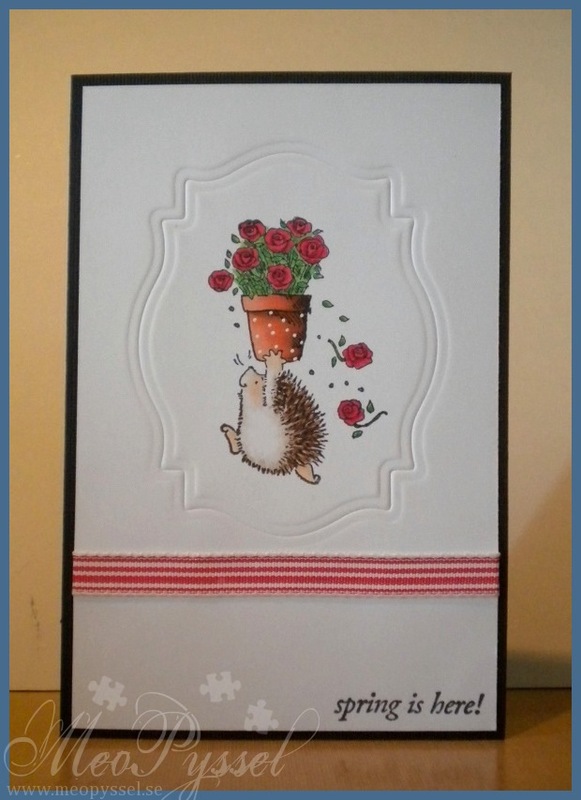 Im also entering this card into the Simon says challenge – emboss it again sense in really happy with the card and the I love Promarker (#62) Anything goes. The image is House Mouse Birthday Cupcake that is a part of the Birthday: Ice Cream-set. 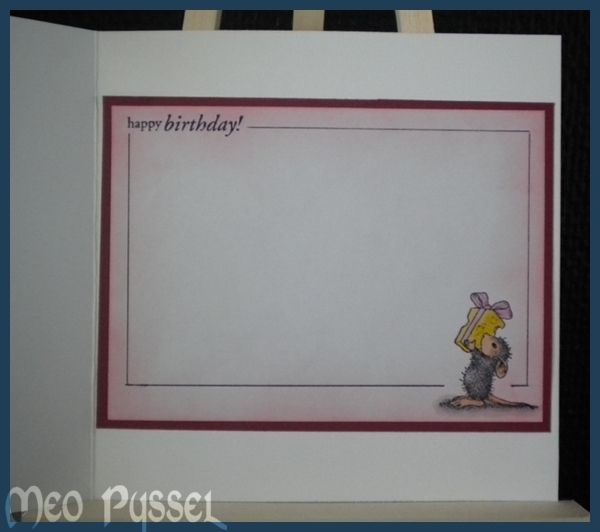 The little mouse with the cheese-gift, on the inside of the card, is from the same stamp-set. The images is colored with promarkers and i’m really happy with the result on the cupcake (gold, apricot and pastel yellow). On the frosting on the cupcake i have used my snowmarker, very thin layer, and then i painted on some Magenta sticklers. I use a brush to paint the stickles so i could get a thin layer and exactly were I wanted it. You can see the dimension and the frosting better in the picture to the right. The sentiment is a Penny Black stamp from the Critter Party-set. I stamped it with Versa Colors 15 Magenta. 184 Misty Mauve and 13 Orange to match the colors on the paper that is from Crate Papers collection Pink Plum. I have tried to keep the color-scheme on the inside. All papers and stamped areas have been distressed with Worn Lipstick and the fabric butterflies have also been distressed with Worn Lipstick and some Spiced Marmelade. The butterflies had a to strong colors so i used the backside up to just get a hint of the original color that i then altered with distress inks. I just stapled on the butterflies with a regular staple-machine. 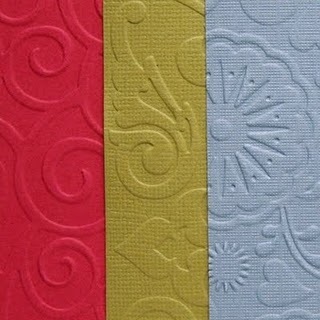 The background paper and the white paper have been dry embossed with provocrafts embossingfolders. On the background i used Victorian and on the white paper i used swiss dots. The border under the ribbon is made by Martha Stewart’s border punch modern garland. The buttons is from old clothing and have been embellished with some multicolored pink thread. 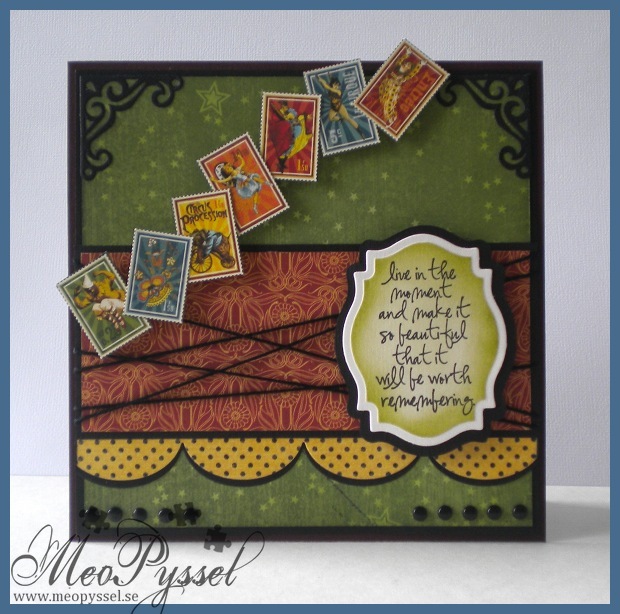 The Layout form this card i got from this weeks Sweet Stop Challenge (SSS104). And due to nice circumstances I’m also entering this card for a couple of more challenges. A Spoon full of sugar (#148) – Let’s Celebrate! And THANK YOU Kristina for borrowing me the Easel. I think it works great and made the photographing much easier. Now i need to but my own and paint it! Today i have been working with this weeks Mojo Monday (#185) and my Penny Black stamps that i have realized i don’t use as much i would like. The striped paper is from DCVW’s paperpack Baby Boy and the white paper is regular cardstock that is embossed with Provocrafts Swiss dots. The image is from Penny Black clearstamp-set Garden friends and it’s colored with promarker and copics and the cheeks are chalked. The sentiment is from the same stamp-set and have been stamped with Shabby Shutters. The bow is double-looped and made with my Bow-easy. 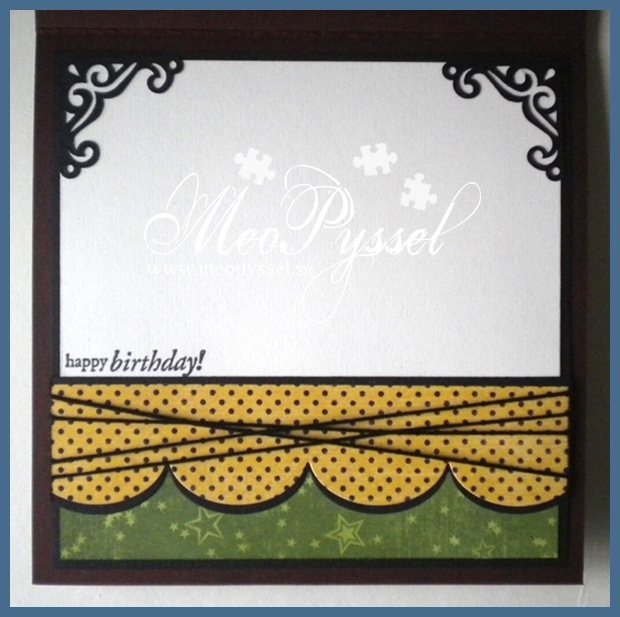 The border is made with Fiskars scalloped border-punch. The image is cut with a nestabilities and a doyle. The flowers are from Reprint and are centered with a brad (there are two different yellow ones). The card is covered (edged, flowers and image and sentiment) with stardust stickles to match the glitter in the striped paper. You can se the layout and the inside at the bottom at this post. Dagens kort är ett vårkort med mjuka och ljus färger för att kompensera den grå himlen utanför. Layouten kommer från veckans Mojo Monday (nr185). Motivet och texteb är från Penny Blacks set Garden friends och jag har faktiskt användt både promarker och copics. Cirklarna är nestabilities och en doyle. Den vita rektangeln är torrebmossad med Provocrafts Swiss Dots embossingfolder och kanten längst ner är Fiskars scalloped borderpunch. Blommorna är från Reprint och är fästa med två olika sorters gula brads. Runt i stort sett alla kanter, blommorna och texten har jag använt stardust stickles. Isidan och orginal-layouten finns underst i inlägget. Idag har jag försökt att ta igen förlorad till så att säga. Den 25 februari fyllde Martin år men på grund av tidsbrist och total utmattning blev inget kort gjort till min kära vän, så idag har jag gjort ett för att gottgöra detta. Jag har försökt att skapa en skogig känsla då Martin är lite av en skogsmulle. Motivet är den söta draken Cinder från Sweet November stamps som jag färglagd med promarker och paper piecing av vingarna. de gröna fläckarna är gjorda med en gul Sakura Gelly Roll och hela cinder har sedan blivit täckt av glossy accent. Hörndekorationerna är ev av Cuttlebugs Vintage Die. De cirkulära formerna är nestabilities dies och happy birthday-stämpeln är från Penny Blacks Critter Party. Det gröna pappret är Basic Greys Henley. Jag har gjort layouten efter veckans utmaning på Sketch Saturday (#146). 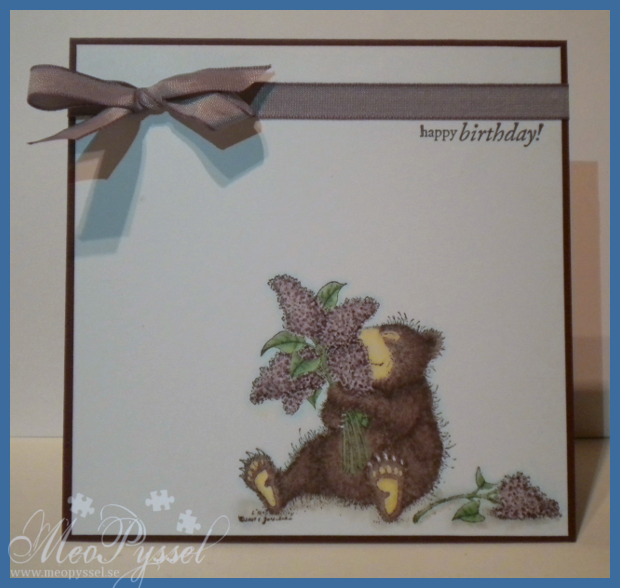 Todays Card is inspired by the forrest and the layout is made from this weeks challenge Sketch Saturday #146. 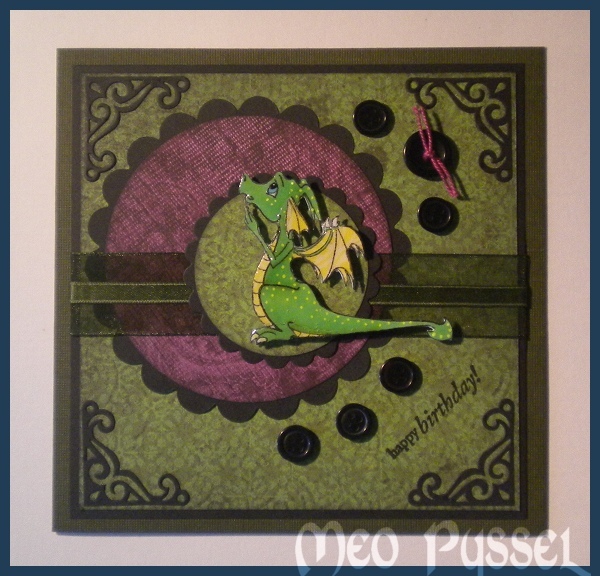 The dragon is Sweet Novemeber Stamps Cinder and the sentiment is from Penny Blacks Critter Party. I have colored Cinder with Promarker and paper pieced his wings with a bright yellow paper. The cornertreatments är från Cuttlebugs die Vintage. The circles are made with nestabilities dies. And the green paper is from Basic Grey and are called Henley.